And in the starring roles were the Kings Of Comedy themselves - Cannon and Ball! In a rundown bar in Majorca we find that Tommy Cannon, one half of the successful comedy duo Cannon and Ball, has retired to Spain having split from Bobby on acrimonious terms. 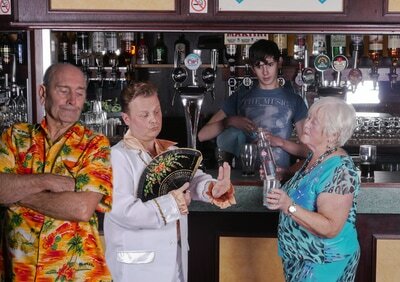 The bar is struggling to survive so with some assistance from his drunken wife, his camp compere and his dopey waiter Tommy plans entertainment to attract new customers. Who could the booked act possibly turn out to be.....? What the papers said . . .
Ah, the nostalgia. This was entertainment reminiscent of the old variety shows, shades of Jimmy Jewell and Ben Warriss, Little and Large, Morecambe & Wise. All that was missing was the pier. Cannon and Ball back in town, albeit a few miles further south than they might once have been, still on the road and bringing in the crowds, this time in a new play written by Bobby Ball himself..
Lots of familiar jokes, a Spanish dancer (Emily Cartmel), a couple of songs, all hung together on a simple plotline whereby Tommy Cannon is running a bar in Majorca having split up acrimoniously with his ex-partner, Bobby Ball. 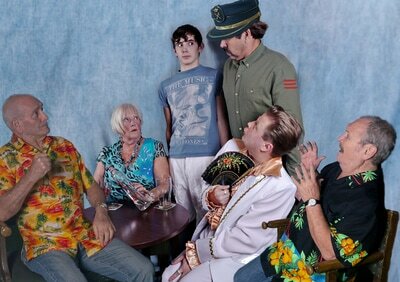 Members of the locally renowned Fylde Coast Players made up the rest of the cast. Paul Lomax made Liberace look positively dull as Johnny Garland (‘after dear Judy’), the bingo caller; Vera Cummings played Tommy’s wife, Doreen, becoming more inebriated by the minute and Richie Withers was Darius, the head-phoned young glass collector who broke into song at every opportunity. When the evening’s act, Jimmy Giggles, arrives, it turns out to be none other than Bobby Ball working under a new name and moonlighting as a funeral director, which accounts for the coffin he brings along. With a body inside. The action moved up a gear with Bobby’s arrival. He immediately brought the audience into the act, commenting on the script he had written (‘I didn’t think that joke would bring so many laughs’). After the interval, everyone in the audience was issued with a bingo card and took part in a game. The joke was that when Johnny Garland called the numbers, half the people in the full house had the winning line. Tommy insists his ex-partner mustn’t do comedy which gives Bobby the chance to sing a decent rendering of ‘That’s Life’ to appreciative applause which he acknowledged gracefully. To round off the plot, Andy Cook comes on as a policeman, looking for a missing husband who turns out to be, yes, the man in the coffin (Tim Greenwood), to the relief of his distraught wife (Helen Barrow), whereupon Tommy and Bobby embrace and make up and everyone joins in for a happy finale. Last year I saw the ‘Birds of a Feather’ team touring with a show based on their old sitcom and from that they got a new TV series. 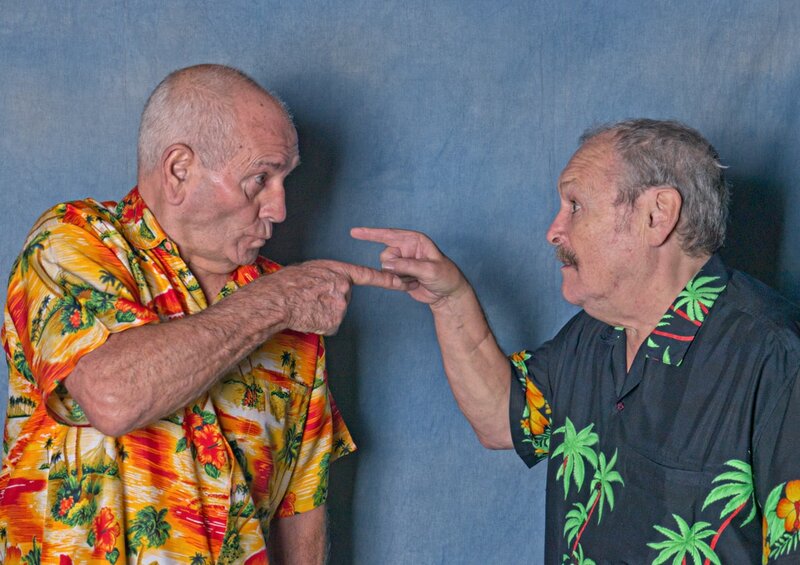 Could this show catapult Cannon and Ball back onto our TV screens? Stranger things have happened.